The iconic Leer Ice Merchandisers are a common sight at convenience stores, grocery stores, and other shops throughout the country. These merchandisers provide a helpful service for customers and offer operators a low-maintenance and dependable revenue stream. Regardless of your industry, low-cost ice is a quick way to reach a broad base of customers, and Leer produces machines that keep that ice cold and readily available. Learn more about Leer products to decide which merchandiser best fits your needs. Customers can quickly recognize the snow-capped ICE of Leer ice merchandisers. Leer has prioritized crafting sturdy cabinets with strict quality-control standards, resulting in a reliable product that lasts for years and maintains its temperature with relatively little environmental footprint. The construction of these merchandisers is based on the same solid design, but we'll go over the unique elements of each type below. All the Leer freezers KaTom carries are measured by how many 10-pound bags of ice they can hold. One-door versions will typically hold fewer bags than the two-door versions, and they can only be accessed by one customer at a time. However, single-door versions of the Leer ice box take up less space than the two-door models and are desirable for establishments with limited space or low volume. One-door merchandisers range in capacity from 80 to 160 bags. 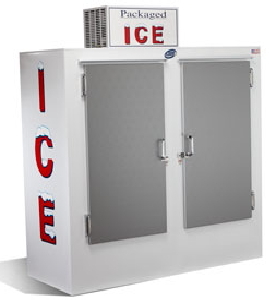 The two-door version of a Leer ice box is typically larger than the single-door unit and offers greater customer accessibility. At an establishment with particularly busy periods, a two-door unit lets customers grab their ice more quickly than a one door could, increasing sales and customer engagement. Two-door options also hold more bags of ice on average, reducing the frequency of refills necessary. However, two-door models take up more space than single doors, so if space is an issue, calculate how many bags of ice you plan to sell over a given time frame so that you don't buy a machine that's bigger than what you need. Slanted-style merchandisers are designed specifically for outdoor use, where you'll have more horizontal space available. Slanted versions are lower to the ground than upright units and require less effort when restocking. Because of their low profile, slant models enable customers to reach in and grab a bag of ice comfortably. Ease of use is a big plus for customers, and the easier you can make the purchase, the more purchases you'll get. Leer makes both indoor and outdoor versions of the upright ice merchandisers. The upright option takes up less space than the slanted option, which makes it ideal for space-limited inside use. Like slanted merchandisers, upright models can have either one or two doors. 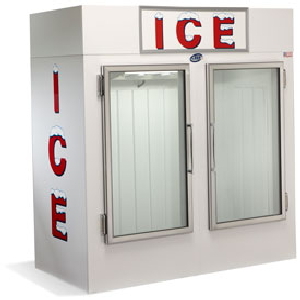 Consider how much space you have available when purchasing an ice merchandiser. Leer's indoor models offer clear glass doors and internal illumination to better merchandise your ice. These doors are made of triple-paned tempered safety glass, which ensures that they won't become a danger customers or employees even under duress. The transparency and light creates a bright, appealing display that draws customers' eyes to the product. To prevent heat from penetrating the Leer freezer, its triple-pane construction keeps two layers of insulating gases between the ice and the environment outside of the unit. Better insulation results in less temperature loss and less power required to maintain freezing temperatures. Leer's indoor merchandisers come standard with HDPE skid plates to prevent damaging floors when installing, reloading, or moving the units. HDPE is high-density polyethylene, a type of strong plastic that is less abrasive than metal footing would be. Preserve your floors with the HDPE skid plates offered by Leer. Leer offers several optional modifications that can improve the function of merchandisers in specific conditions. We'll go over these options below and discuss the situations in which they would be useful. Buyers can choose to purchase a unit with a reversing fan that helps keep the condenser unit clean. By intermittently reversing the direction of airflow over the condensers, this system will prolong the life of the ice cabinet and cut down on necessary maintenance. This change of airflow helps wick away particle buildup that, on a single-direction unit, would congeal over time until the machine needed to be opened up and cleaned. Air flowing the opposite direction of the primary buildup pulls particles off the condenser coils and keeps them operating at full capacity. Automatic defrost is a feature that enhances freezers using cold-wall technology. Cold-wall refrigeration consists of copper wiring that runs through the walls of the freezer, and in warm or humid outdoor locations, this system can lead to condensation buildup. When condensation sits in the freezer long enough, it freezes on the wires and impedes the unit's function. Ice boxes with an automatic defrost feature, though, can remove some of this condensation on their own and reduce the overall maintenance requirements. 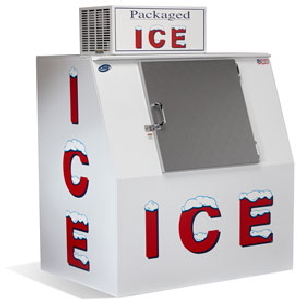 Leer outdoor ice merchandisers are designed to keep ice frozen even in the middle of summer, but not all summers are created equal. 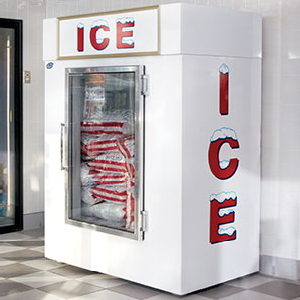 If your establishment is located in a place with particularly intense summers, consider upgrading your ice merchandiser with Leer's heavy-duty refrigeration option. Frequent use in any climate will also tax the refrigeration systems and could result in higher temperatures, as the machine may struggle to keep up with frequent influxes of extreme heat. Leer can customize the electrical system of your merchandiser to match voltages outside of the US standard. If you plan on installing an ice merchandiser somewhere that needs non-standard voltage, give KaTom customer support a call to help you get the right machine with the right plug for your outlets. If the standard look doesn't fit your style, Leer offers customizable exterior paint and logos on its ice merchandisers. Gold and black framed doors are also available in place of the regular silver or gray doors. Bumper guards protect the ice merchandisers from impacts with heavy equipment, be it cars, forklifts, or runaway shopping carts. If your merchandisers will be in high-traffic areas, bumper guards can be a good investment towards keeping your merchandiser looking new as long as possible.